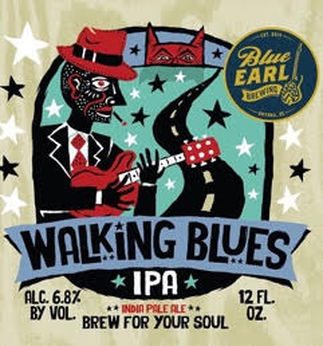 Walking Blues IPA – American IPA – The beer’s namesake “Walking Blues” is a blues standard written by Son House, but made famous by Robert Johnson in 1936 and reaching popularity after its reissue on the LP King of the Delta Blues Singers in 1961. Grains: British and American 2-row, small proportion of specialty malts. Hops: Mosaic, Chinook, Centennial, Citra, Amarillo and Simcoe. This beer style is a hop showcase with just enough malt to support the splendor. Superb drinkability with a medium-dry finish. A hop carnival in your mouth. Notes: citrus, pine and tropical fruit.